Station 13 in 2010. Photo by Jason Simpson. Mark your calendars for a family celebration on Saturday, May 19 from 11-1 p.m., when the newly-remodeled Fire Station #13 holds a dedication and open house, sponsored by the Seattle Fire Department and by the Seattle Fire Fighters Union, Local 27. The event will include tours of the fire station, a chance to meet your local firefighters, activities for children, and refreshments. The station, a Mission Revival-style building constructed in 1928, is a designated Seattle Landmark. From the outside, it looks much the same as it has for 84 years. But inside, it now has expanded square footage, improved decontamination facilities, increased equipment storage, an improved fire alarm and sprinkler system, and a new kitchen. It also has a new roof, an emergency generator, and it has been given a seismic upgrade. Fire crews were temporarily relocated to Station 14 in Sodo for several months during the remodeling project. The building was previously renovated and expanded in 1987, and received emergency seismic repairs after the 2001 Nisqually earthquake. 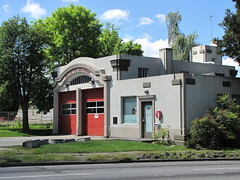 Station 13 is located on the southwest corner of Beacon and Spokane, at 3601 Beacon Ave. S.